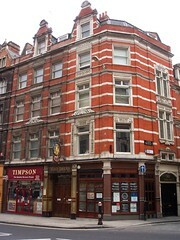 An imposing Victorian pub on Fleet Street, just by Ludgate Circus. It was originally a much larger establishment, but part of the original pub split off a few years back and is now trading under the pub's original name, The Crown & Sugar Loaf. Note: According to the Dec 2017/Jan 2018 London Drinker, the Punch Tavern was taken over by a new operator, Urban Pubs & Bars, in September 2017. We haven't visited since, so some or all of the below may be out of date. Entered through a mosaic-tiled lobby, this is an attractively maintained pub, with banquettes around the edge of the room and further tables scattered around. Lighting is kept dim, with fairylights around the edges of the mirrors for atmosphere. A back room is available for functions. On Kake's Wednesday evening visit in January 2016, there were plenty of free seats at 7pm, and only a handful of people remaining at 10pm. The only ale on handpump on Ewan's visit in August 2008 appeared to be Theakston Best Bitter, but there was a good range of other beers, as well as some perfectly drinkable wines. In January 2016 the real ales were Sharp's Doom Bar and Marston's EPA, and they also had beers from Marston's "craft" range, including Revisionist Stout (£4.20/pint). The pub seems to specialise in gin and gin-based cocktails. According to a sign seen in January 2016, quiz night is Tuesday. Accessibility: No steps to get in, but the toilets are in the basement down a winding, narrow flight of stairs. A step to the back room. Last visited by Kake et al., January 2016. Opening hours taken from the Punch Tavern website, December 2017. Last edited 2017-12-04 10:34:04 (version 7; diff). List all versions. Page last edited 2017-12-04 10:34:04 (version 7).